A human oriented object programming system provides an interactive and dynamic modeling system to assist in the incremental building of computer programs which facilitates the development of complex computer programs such as operating systems and large applications with graphic user interfaces (GUIs). A program is modeled as a collection of units called components. A component represents a single compilable language element such as a class or a function. The three major functionalities are the database, the compiler and the build mechanism. The database stores the components and properties. The compiler, along with compiling the source code of a property, is responsible for calculating the dependencies associated with a component. The build mechanism uses properties of components along with the compiler generated dependencies to correctly and efficiently sequence the compilation of components during a build process. The present invention generally relates to computer aided software engineering (CASE) and, more particularly, to human oriented object programming system (HOOPS) which provides an interactive and dynamic environment for computer program building. The invention allows a programmer to perform fine granularity source code editing in a computer program with an optimizing incremental compiler which is especially useful in developing complex programs, such as operating system (OS) software and large applications having graphic user interfaces (GUIs). The invention is disclosed in terms of a preferred embodiment which uses a popular object oriented programming (OOP) language, C++, but the principles are applicable to other computer programming languages both object oriented and procedural and may be used to build programs using both conventional and OOP languages. Examples of OOP languages are Smalltalk and C++. Smalltalk is actually more than a language; it might more accurately be characterized as a programming environment. Smalltalk was developed in the Learning Research Group at Xerox's Palo Alto Research Center (PARC) in the early 1970s. In Smalltalk, a message is sent to an object to evaluate the object itself. Messages perform a task similar to that of function calls in conventional programming languages. The programmer does not need to be concerned with the type of data; rather, the programmer need only be concerned with creating the right order of a message and using the right message. C++ was developed by Bjarne Stroustrup at the AT&T Bell Laboratories in 1983 as an extension of C. The key concept of C++ is class, which is a user-defined type. Classes provide object oriented programming features. C++ modules are compatible with C modules and can be linked freely so that existing C libraries may be used with C++ programs. The complete process of running a computer program involves translation of the source code written by the programmer to machine executable form, referred to as object code, and then execution of the object code. The process of translation is performed by an interpreter or a compiler. In the case of an interpreter, the translation is made at the time the program is run, whereas in the case of a compiler, the translation is made and stored as object code prior to running the program. That is, in the usual compile and execute system, the two phases of translation and execution are separate, the compilation being done only once. In an interpretive system, such as the Smalltalk interpreter, the two phases are performed in sequence. An interpreter is required for Smalltalk since the nature of that programming environment does not permit designation of specific registers or address space until an object is implemented. To aid in the development of software, incremental compilers have been developed in which the compiler generates code for a statement or a group of statements as received, independent of the code generated later for other statements, in a batch processing operation. The advantage of incremental compiling is that code may be compiled and tested for parts of a program as it is written, rather than requiring the debugging process to be postponed until the entire program has been written. However, even traditional incremental compilers must reprocess a complete module each time. While considerable advances have been made in the art of computer program building, testing and developing, a substantial burden remains on the programmer to define the software architecture in terms of the dependencies among a program's software objects BEFORE program building can commence. An example of such a software maintenance system is described by patent EP 0 496 494 A2. The patent discloses a software maintenance system representing an advance in the art over the UNIX (TM) Make utility by using object oriented methodology to provide a parser to reference programmer-supplied object and event definition files to generate intermediate "object assembly" language. The object assembly language is then processed by a dependency interpreter to recursively identify target objects on which an initial object and other identified target objects depend. The system thus ensures that all lower level dependency conditions have been satisfied before a present object is evaluated. Though representing an advance over the Make utility which simply executes each rule listed in a make file which follows a determination that an object is out of date with respect to its source, the system described by patent EP 0 496 494 A2 still requires a programmer to first provide object and event definition files which define software system dependencies; an error prone task that often requires insightful intuition. It is therefore an object of the present invention to provide a human oriented, interactive and dynamic process for modeling computer programs which promotes better programmer focus and concentration, and hence greater productivity. Accordingly, program building is made possible by the interaction of an incremental program model, called a project, and three major functions. A program is modeled as semantic units called components made up of a list of named data items called properties. Rather than storing a program as a loose collection of files as is done in traditional systems, the human oriented object programming system (HOOPS) of the invention stores all the information about the program in the project. In HOOPS, components are the granularity for incremental compilation; that is, a component represents a single compilable language element such as a class or a function. A component is composed of a set of properties which are divided into two parts, an externally visible (or public part) called the Interface and an Implementation (the private part). This means that a component can only be dependent on the interface of another component. All the components in a project are organized into a tree structure, with the base of the tree being a root component called the project component. The three major functions are the database, the compiler and the build mechanism. The database persistently stores and retrieves the components and their properties. The compiler, along with compiling the source code of a property, is responsible for calculating the dependencies associated with a component. The build mechanism uses properties of components along with the compiler generated dependencies to correctly and efficiently sequence the compilation of components during a build process. The build mechanism has a global view of a program at all times. This contrasts with the traditional approach where the program is represented by a set of files that are compiled independently of each other. Files used in traditional programming environments impose a particular fixed order of processing on the semantic units contained in the files. The system automatically keeps track of editing changes in components, including whether a change was in the Interface or Implementation. This in contrast to conventional systems that track only at the file level. Dependency analysis is automatic and is based on relations between components. The system includes a mechanism that allows the compiler to record not only the fact that a dependency exists, but what sort of dependency it is. This allows the build mechanism to determine with more precision which components actually need compilation, making the system more efficient than recompiling all components for which a dependency exists whether recompilation is needed or not. Conventional compilers make use of software construction tools in the programming environment to facilitate generating the software. For example, it is customary in conventional program construction to partition the overall program into modules, typically stored within individual files, each of which may be processed in different ways. A Make command is employed to manage and maintain the modules making up the computer program; that is, the Make function keeps track of the relationships between the modules of the program and issues only those commands needed to make the modules consistent after changes are made. It is necessary, however, for the programmer to generate a Makefile specification that defines the relationships (dependencies) between the modules. The requirement for a Makefile specification means that the programmer must be able to decide when a dependency occurs and places the burden of synchronizing dependencies on the programmer. In practice, this usually means both the existence of unnecessary dependencies and the omission of necessary dependencies, both of which can be a source of error in the building of the computer program. In contrast to the Make function, the build mechanism, according to the present invention, differs in that the programmer does not generate a specification like the Makefile specification. The build mechanism assumes no pre-knowledge of dependencies; in effect, it "discovers" the dependencies of the components and keeps track of those dependencies. This means that the build mechanism will build a program from scratch when there is no pre-existing dependency information. In the initial build operation, all components are listed in a change list. A compilation of a component on the change list is attempted, but if that compilation is dependent on the compilation of another component, the compilation of the first component is either suspended or aborted and the compilation of the second component is attempted and so on until a component is found which can be compiled. Then the build mechanism works back through components for which compilation was earlier suspended or aborted making use of any information already generated earlier in this process. 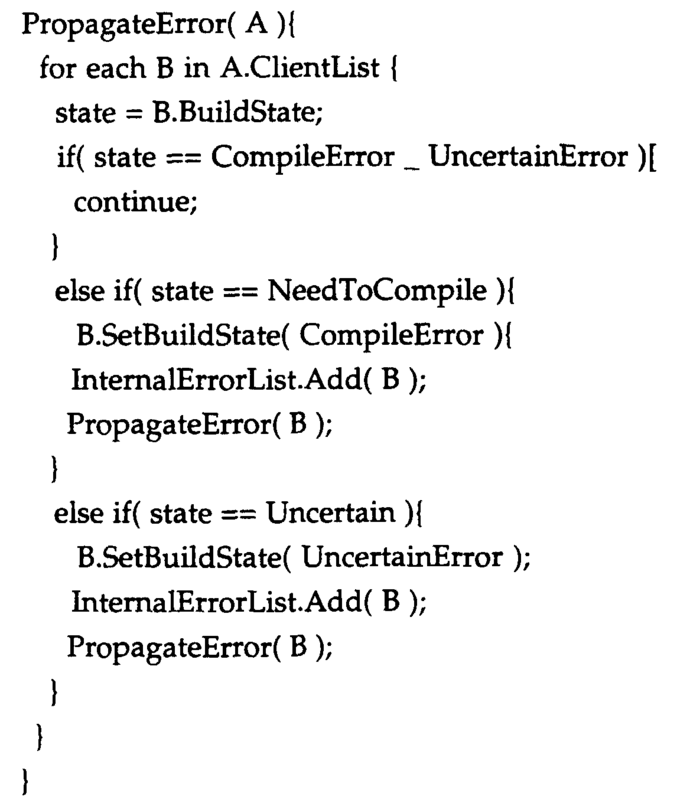 The build mechanism orders compilations so that all Interfaces are compiled before any Implementation. This reduces the number of possible cross dependencies and hence increases efficiency. The build mechanism utilizes a form of finite state machine to control the processing of components and to help ensure their correct ordering in a manner to minimize the suspended or aborted compilations of components. A build operation after a change has been made (editing a component or adding or deleting a component) is similar to the initial build operation except that the change list contains only those components which have been changed, and the build mechanism uses the previously developed client and source reference lists to recompile only those components requiring recompilation. The function-level incremental compilation implemented by the invention greatly reduces the turnaround time from program change to test since a much smaller proportion of a program will typically be rebuilt. The program model provides a method for storing and reusing an internal processed form for Interfaces (called the Declaration property). The compiler stores the processed internal form of an Interface so that it can be used more efficiently when compiling some other component. This is in contrast to traditional systems where interfaces to be used are "included" in every file where a use is made and reprocessed to an internal form by the compiler every time. Additionally, the program model of components and properties provides a natural way to store information closely coupled with a particular component. This information can be used either directly by the programmer or indirectly by other tools. In traditional systems, such data is either forgotten at the end of a compile or is only loosely coupled with the program source. Error processing allows the build mechanism to avoid compiling components that depend on components with errors. The build mechanism will correctly build as much of the project as possible. These both contrast with traditional systems which often stop at the first erroneous file or, if they proceed, will repeatedly process erroneous included files. Error processing allows warning messages to be issued by the compiler without causing the specific component to be treated as in error. This processing allows the program to be correctly built even when warnings are issued. The invention further provides an incremental linking facility which is the complement to the incremental compilation facility. Functions are linked into existing executables, replacing old versions. There is no need to reprocess the entire set of object files as in traditional systems. This processing reduces link times from minutes to seconds during program development. Access to any stored information about any part of a user's program is immediately available from wherever it is referenced, providing a hyper-link style navigation within the program. Some systems support a facility which allows quick access from an object's use to its definition, but HOOPS goes beyond this by supporting immediate access to any information (e.g., definition, documentation, clients, references, etc.) from any reference to the object (in source code, in object code, in documentation, etc.). This greatly reduces the time spent rummaging around in the program, libraries, documentation, etc., during both development and maintenance. HOOPS also provides a dynamic browser facility which allows users to build browsing tools dynamically, by splitting windows into multiple panes, installing "viewers" and then drawing connections between them to indicate interactions between them. This facility cuts down on window proliferation and speeds navigation. Figure 25 illustrates different types of references and linker modification of the references in accordance with a preferred embodiment. Referring now to the drawings, and more particularly to Figure 1, there is shown a general purpose computer 10. The computer 10 has a system unit 12 a high resolution display device 14, such as a cathode ray tube (CRT) or, alternatively, a liquid crystal display (LCD). The type of display is not important except that it should be a display capable of the high resolutions required for windowing systems typical of graphic user interfaces (GUIs). User input to the computer is by means of a keyboard 16 and a cursor pointing device, such as the mouse 18. The mouse 18 is connected to the keyboard 16 which, in turn, is connected to the system unit 12. Alternatively, the mouse 18 may be connected to a dedicated or serial port in the system unit 12. Examples of general purpose computers of the type shown in Figure 1 are the Apple Macintosh® (registered trademark of Apple Computer) and the IBM PS/2. Other examples include various workstations such as the IBM RISC System/6000 and the Sun Microsystems computers. Figure 2 illustrates in more detail the principle elements of the general purpose computer system shown in Figure 1. The system unit 12 includes a central processing unit (CPU) 21, random access memory (RAM) 22, and read only memory (ROM) 23 connected to bus 24. The CPU 21 may be any of several commercially available microprocessors such as the Motorola 68030 and 68040 microprocessors commonly used in the Apple Macintosh® computers or the Intel 80386 and 80486 microprocessors commonly used in the IBM PS/2 computers. Other microprocessors, such as RISC (for reduced instruction set computer) microprocessors typically used in workstations, can also be used. The ROM 24 stores the basic microcode, including the basic input/output system (BIOS), for the CPU 21. The operating system (OS) for the computer system 10 may also be stored in ROM 24 or, alternatively, the OS is stored in RAM 22 as part of the initial program load (IPL). RAM 22 is also used to store portions of application programs and temporary data generated in the execution of the programs. The bus 24 may be the Apple NuBus®, the IBM MicroChannel® or one of the industry standards such as the ISA (industry standard adapter) or EISA (extended industry standard adapter) buses. A component also has a name which consists of a string of text containing no white space. There is no requirement that different components have different names. It is possible to obtain a list (possibly empty) of all components whose names match some given text string. A component's name may be changed any number of times during the existence of the component. Components have BuildStates. A BuildState is a value from the list NeverCompile, Compiled, NeedToCompile, Uncertain, BeingCompiled, CompileError, and UncertainError. In practice, these values are usually numerical. 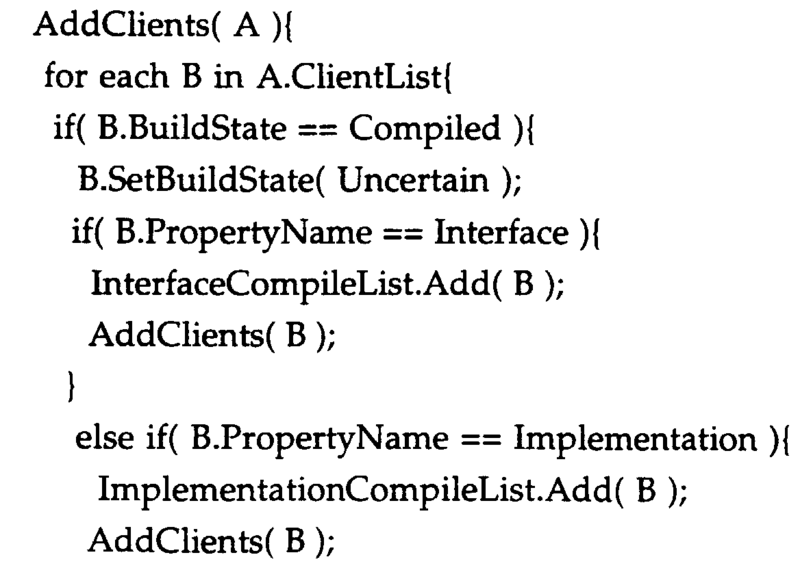 Each component has a pair of BuildStates called InterfaceBuildState and ImplementationBuildState. Every component has both these buildstates whether it is buildable or non-buildable. For a non-buildable component, these BuildStates are both NeverCompile. A component consists of a collection of named properties. A property represents some data associated with the component. It is possible to retrieve or store data given a component's ID and a property name. In practice, property names are usually internally represented by numbers identifying the names (such numbers are sometimes called tokens). There is a distinguished property name called NullProperty which belongs to no property. The built property (also called the components built list) records the list of properties correctly compiled in the last build, in the order that they were built. The same property should only appear at most once on this list. It is used for testing and debugging. A buildable component must also have properties Declaration, Object Code, Clients, SourceReferences, Errors and may have properties Interface, Implementation, and Members. Figure 3 provides a conceptual representation of a program as composed of a set of components 31. Each component is composed of a set of properties which are divided into two parts, the externally visible (or public) part 311 called the Interface and the Implementation 312 (the private part). As shown in Figure 3, components are dependent only on the interface of another component. All the components in a project are organized into a tree structure, with the base of the tree being a root component 32 called the project component. As will be understood by those skilled in the art, the components are not necessarily self-contained entities but may include pointers pointing to storage locations for actual code. Nevertheless, this tree-structured representation is useful in presenting the organization of a program and, therefore, a similar tree-structured representation is used in one of the user screens described hereinafter. Figure 4 is a block diagram showing the three major functionalities of the invention. These are the database 41, the compiler 42, and the build mechanism 43. The database 41 is composed of a set of components, here shown as a project component 411 and a collection of buildable components 412 which model a program which is to be built. The compiler 42 calculates the dependencies associated with the components in the database 41. The build mechanism 43 uses properties of components along with compiler generated dependencies to build the program. A programmer changes the program by means of an editor 44. The editor must be capable of creating and deleting components, and typically of cutting, copying, pasting and moving components. The editor must be capable of changing the data in the Interface and Implementation properties usually by allowing direct modification of text, although other more structured approaches such as selection 1 from menus are possible. In practice, the editor 44 will often consist of a number of editors, possibly as many as one for each type of Interface or Implementation property or possibly even for subfields of data in those properties. Reference is made to Figures 5A to 5D which show flowcharts illustrating the logic of the functions performed by the editor associated with incremental building 44. For buildable non-synthetic components, BuildStates are confined to the values Compiled and NeedToCompile outside the build process. If the Interface property is not present, the InterfaceBuildState is Compiled. 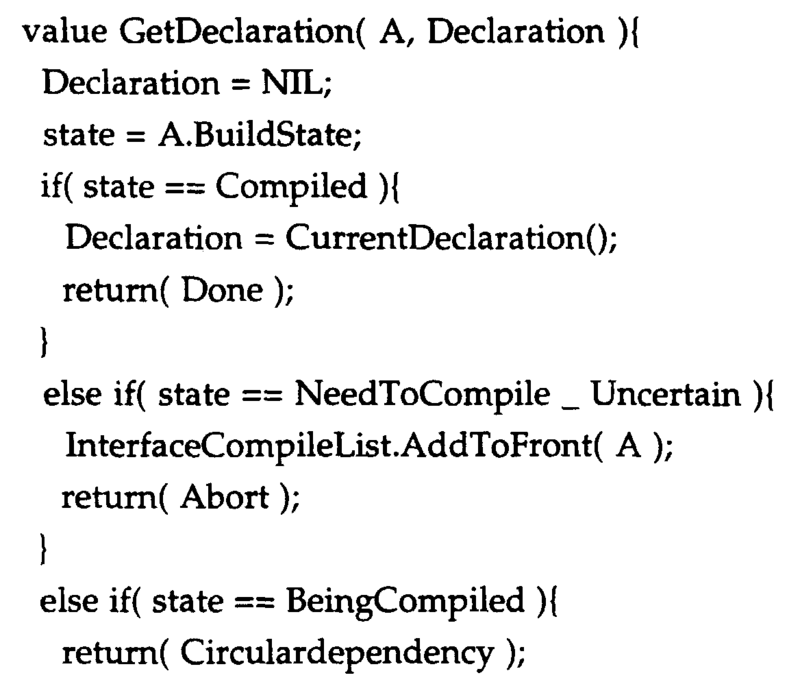 If the Implementation property is not present, the ImplementationBuildState is Compiled. In Figure 5A, the various editing state changes are presented. At label 500, when the system identifies a CreateComponent, RenameComponent, PasteComponent or EditInterface command, control passes to function block 510 to process the interface change. The detailed logic for the change is set forth in Figure 5B. In Figure 5B, processing commences at decision block 511 where a test is performed to determine if the interface build state is NeedToCompile. If so, then control is passed via label 514 to continue editing. These actions take place during editing, not during the rebuild. The next action is most likely another editing action. If not, then at function block 512, the interface build state is set to NeedToCompile and the interface change list is updated accordingly. Then, at function block 513, the implementation changed and container changed processing is completed. The details of the implementation changed operation are presented in Figure 5C and the container changed operations are detailed in Figure 5D. Figure 5C sets forth the detailed processing associated with implementation changed. At decision block 571, a test is performed to determine if the implementation build state is already set to NeedToCompile. If so, then control is passed via label 572 to continue editing. If not, then at function block 573, implementation build state is set equal to NeedToCompile and implementation change list is updated accordingly. Then, control is passed back via label 574. Figure 5D sets forth the detailed logic associated with a container change operation. A test is performed at decision block 542 to determine if the variable is buildable. If so, then at function block 543, interface changed is called with component's container as detailed above in the discussion of Figure 5B. Then, control returns via label 544. If an Edit Implementation command is detected at label 560 of Figure 5A, then processing carries out an action implementation changed as set forth in function block 570 and detailed above in the discussion of Figure 5C. If a Delete Component command is detected at 530 of Figure 5A, then the container changed processing for component A is initiated as shown in function block 540 and detailed in the discussion of Figure 5D. Then, container A is deleted, and control is returned via label 550. If a Move Component command is detected at 580 of Figure 5A, then the container changed processing for component A is initiated as shown in function block 590 and detailed in Figure 5D. Then, the component's container is set equal to new container, and the interface changed processing for component A is initiated as detailed in Figure 5B. Finally, processing is returned via label 595. The process is shown in Figure 6. For each reference in the Project's ChangeList, as indicated by function block 601, a reference is chosen from the front of the list. If there are no more references on the list, processing is complete as indicated at block 602. If the reference is an Interface, as determined at block 603, a copy of the reference is placed in the InterfaceCompileList in and the function AddClients is called to the reference in function block 604 before processing continues at block 601. If its property name is not Interface, then its property name is Implementation, as indicated at block 605, and a test is made in decision block 606 to determine if its IsInline attribute is True. If so, a copy of the reference is placed in the InterfaceCompileList and the function AddClients is called on the reference in function block 607 before processing continues at block 601. Otherwise, its property name must be Implementation and its IsInline attribute must be False, and a copy of the reference is placed on the Implementation CompileList in function block 608 before processing continues at block 601. This is the second stage of the Build process. The possible BuildStates for items on the InterfaceCompileList are Compiled, BeingCompiled, NeedToCompile, Uncertain, CompileError or UncertainError. The Interface CompileList is processed until it is empty as shown in the flowchart of Figure 7. The process is entered at block 701 where a reference is chosen from the front of the InterfaceCompileList. If there are no more references on the list, processing is complete at block 702. If the interface BuildState of the component associated with the reference is Compiled, CompileError or UncertainError, as indicated in block 703, the reference is removed from the front of the list and processing continues in block 701. If the Interface BuildState of the component associated with the reference is BeingCompiled or NeedToCompile, as indicated in block 704, the BuildState of the component is set to BeingCompiled in function block 705. Then the Compile function (which invokes the compiler 42) is called on the Interface of the component. This function will return one of the values Abort, Done and Error. If the value returned is Abort at block 706, then processing continues at block 701. If the value returned is Done at block 707, then the Interface BuildState of the component is set to Compiled and the reference is removed from the front of the list at block 708 before processing continues with block 701. If the value returned is Error at block 709, then the Interface BuildState of the component is set to CompileError, the reference is removed from the front of the list, and the function PropagateError is called on the component in function block 710 before processing continues at block 701. If the Interface BuildState of the component associated with the reference is Uncertain, as determined at block 711, the BuildState of the component is set to BeingCompiled at function block 712. Then the ConditionallyCompile function (which may or may not call the compiler 42) is called on the Interface of the component. This function will also return one of the values Abort, Done and Error. If the value returned is Abort, then processing continues at step 1. If the value returned is Done at block 713, then the reference is removed from the front of the list at function block 708, and processing continues at block 701. If the value returned is Error at block 714, then the reference is removed from the front of the list and the function PropagateError is called on the component in function block 715 before processing continues at block 701. 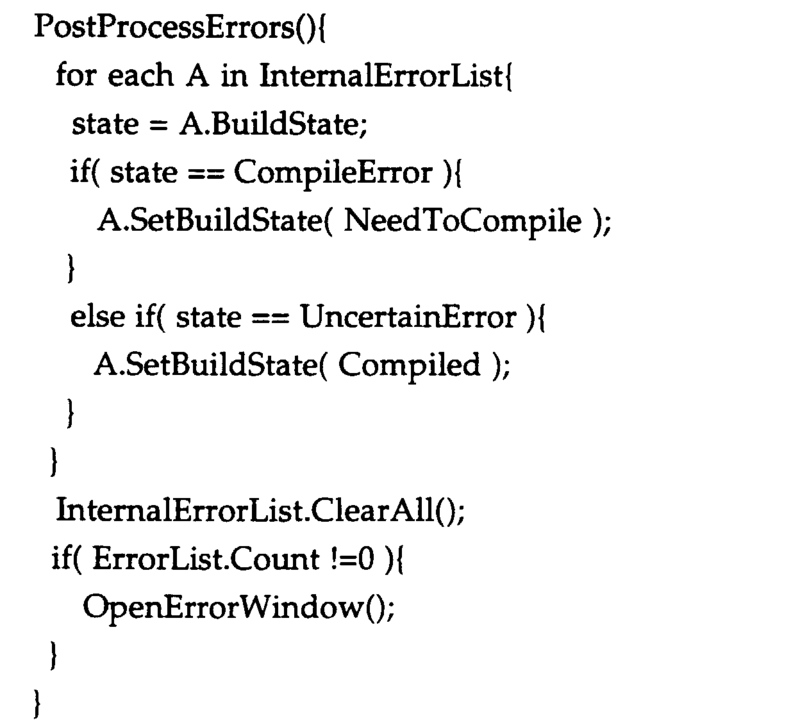 The function PropagateError adds a reference corresponding to the component to the Project's InternalErrorList and carries out the following for every reference on the component's Client list: If the reference's BuildState is CompileError or UncertainError, the process continues with the next reference. If the reference's BuildState is NeedToCompile, the process sets its BuildState to CompileError, adds the reference to the InternalErrorList, and calls PropagateError on the reference before continuing with the next reference. If the reference's BuildState is Uncertain, the process sets its BuildState to UncertainError, adds the reference to the IntemalErrorList, and calls PropagateError on the reference before continuing with the next reference. This is the third stage of the Build process. Each reference in the ImplementationCompileList is processed as shown in the flowchart of Figure 8. The process is entered at block 801 where a reference is chosen from the front of the ImplementationCompileList. If there are no more references on the list, processing is complete at block 802. If the BuildState of the reference is Uncertain, as determined in block 803, the BuildState is set to Compiled in function block 804 before processing continues in block 801. If the BuildState of the reference is NeedToCompile, as determined in block 805, the component is compiled in function block 806. The possible values returned from the compiler 42 are Done and Error. If the value returned is Done at block 807, the BuildState of the reference is set to Compiled in function block 804 before processing continues in block 801. If the value returned is Error in block 808, the BuildState of the reference is set to CompileError and the function PropagateError is called on the component in function block 809 before processing continues in block 801. If the BuildState of the reference is CompileError or UncertainError, nothing is done. Note that the processing of Implementations is order independent at this stage because dependencies can only be on Interfaces or Implementations whose IsInline attribute is True, and these have already been processed. The compiler first calls the GetDeclaration function, which is illustrated by the flowchart of Figure 9. The GetDeclaration function returns one of the values Abort, Done, Circulardependency or Error and may additionally return the data of the Declaration. The process is entered at block 901 where each reference is examined for its BuildState. If there are no more references to process, as indicated by block 902, processing is complete and a return is made. If the BuildState of the component is Compiled, as indicated at block 903, the function returns Done at function block 904, and the stored Declaration data is also returned, before processing continues at block 901. If the BuildState of the component is NeedToCompile or Uncertain, as indicated at block 905, a reference corresponding to the component is added to the front of the InterfaceCompileList in function block 906 and the function returns Abort in function block 907 before processing continues at block 901. Declaration data is not returned in this case. If the BuildState of the component is BeingCompiled, as indicated by block 908, then the function returns Circulardependency at function block 909 before processing continues at block 901. Declaration data is not returned for this case either. If the BuildState of the component is CompileError or UncertainError, as indicated in block 910, then the function returns Error in function block 911 before processing continues at block 901. Again, declaration data is not returned. If the compiler successfully completes processing of the source text, it will produce object code and pass that to the Linker function to incrementally link. Alternatively, the object code could be stored until the end of the build process and linked in a traditional fashion. The flowchart for the function ConditionallyCompile is shown in Figures 10A and 10B, to which reference is now made. Each component B in a component A's SourceReferences is processed in block 1001. If all components B have been processed, as indicated by block 1002, then processing is complete as to the components B, and the process goes to Figure 10B to compile component A. 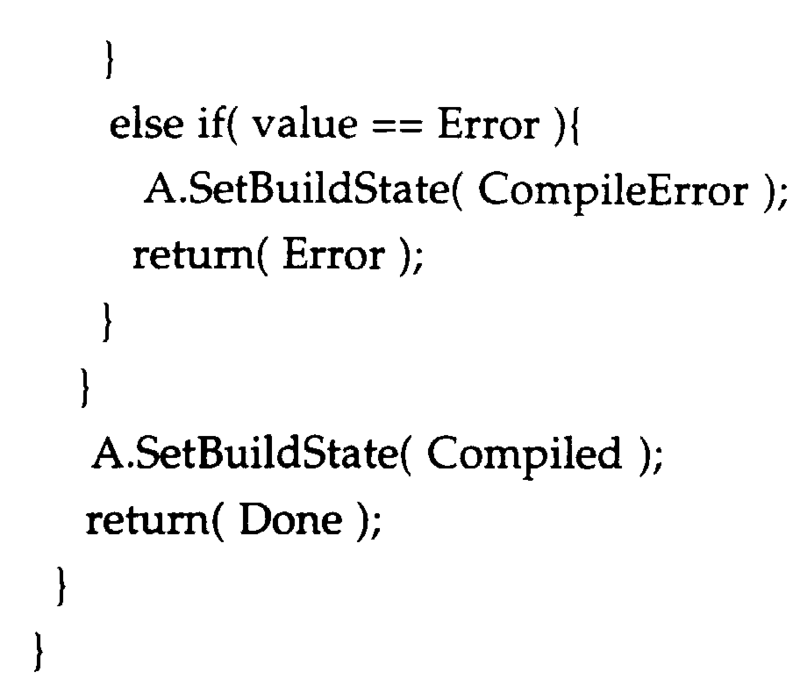 If the BuildState of component B is BeingCompiled or NeedToCompile, as indicated at block 1003, the BuildState of the component is set to BeingCompiled and the component is compiled in function block 1004. The Compile function may return one of the values Done, Abort or Error. If the value Done is returned in block 1005, processing continues in block 1001. Turning now to Figure 10B, if all the reference's have been processed, then they all have the BuildStates Compiled. However, one of the SourceReferences may have propagated a change to the component during the processing to this point, and so its BuildState may now be either BeingCompiled or NeedToCompile. Therefore, the BuildState of component A is determined in block 1016. If the BuildState is NeedToCompile, as indicated at block 1017, then the BuildState is set to BeingCompiled and component A is compiled in function block 1018. The compiler can return either Error or Done. Note that Abort should never occur because all the SourceReferences are Compiled at this stage. If Error is returned in block 1019, then the BuildState is set to CompileError and Error is returned in function block 1020. If Done is returned in block 1021, then the BuildState is set to Compiled and Done is returned in function block 1023. If the BuildState of component A is BeingCompiled, as indicated at block 1024, then the BuildState is set to Compiled and Done is returned in function block 1023. The Human Oriented Object Programming System (HOOPS) according to the invention can be started on the computer by entering either a project name or an existing project name, depending on whether a new program is to be built or an existing program is to be edited. When HOOPS is started, a window is opened and an initial screen similar to the one shown in Figure 11 is displayed. The initial window that HOOPS opens displays the Members property of the Project component and its immediate members. Although it initially only displays the immediate members, the same window is used to display every component starting at the project component. In the example shown in Figure 11, a Project called "Payroll" has been imported. Every window in HOOPS is a browser. Browsers are temporary viewing and editing tools for looking at information in the Project. They can be deleted at any time by clicking on the close icon in the window. Any changes made to the Project while in the browser are automatically saved. A browser has an input component that is specified when it is opened. A property of the input component is displayed in a pane, and each pane displays one property viewer or is blank, as shown in Figure 12. New panes are added to a browser by choosing one of the split icons in the upper right corner of a pane. When a new pane is created, default wiring is created from the pane being split to the new pane. Wiring is the logical relationship between a pane. A pane can have zero or one wire input and zero or more wires as output, but wiring cannot form a loop. When a component is selected in a pane, the selection is converted into a reference to a component in the project and becomes a new input to the destination of any wires emanating from that pane. The wiring can be turned on by choosing Turn on Wiring from the Browser menu selected from the menu bar, resulting in the display shown in Figure 13. Using this display, it is possible to change the wiring between two panes by clicking down with the mouse on the new input location and dragging to the target pane. In many viewers, such as Members, Clients and References, components can be distinguished by their names and their icons, which differ by component kind. In other viewers, a component's name simply appears in the text, such as in Source or Documentation. The component hierarchy can be browsed by expanding and collapsing container components in the Members property viewer, producing a Tree view, an example of which is shown in Figure 14. One level of a component's subtree can be expanded or collapsed by clicking the component's circular toggle switch. When a component is selected in a viewer, either by clicking on its icon if it has one or by selecting its name in a text display, the Property menu in the global menu bar is adjusted to list the properties for that type of component. Any property of any component can be viewed by selecting the component in a viewer and then choosing a property from the Property menu. This opens a new browser containing a single viewer which displays the chosen property of the selected component. Figures 15 to 18 illustrated some of the screens displayed in the process of editing a component. Figure 15 shows the display of the source code of an Implementation of a function called "main". In Figure 16, the function "main" has been edited by changing numberDisks from "7" to "9". If the programmer now chooses Show Components Changed from the Build menu shown in Figure 17, a browser like that shown in Figure 18 appears. In the "Implementation Changes" viewer (on the right), the function "main" is displayed indicating that it has been changed. This description lists the important features of the HOOPS linker, then it provides background on the runtime environment of a preferred embodiment, and the HOOPS database to provide the context in which linking occurs. Finally, a discussion of component linkage, and the interaction of components with the HOOPS compiler, the HOOPS database, and the system loader is provided with reference to a preferred embodiment. A "QuickPublish" step will be available for quickly separating the application from HOOPS for sharing with others, or moving to another machine. The linker is extensible because the compiler may specify new fixups that the linker doesn't normally handle. The linker operates inside HOOPS, and creates files that are used by the loader. To understand the linker strategy, it is important to understand the unique aspects of both the runtime system and HOOPS. While each TLoadModule class may implement cross-library calls in many different ways, the standard method is to jump through a linkage area that is patched at load time. The linkage area serves as an indirect jump table between libraries. An external call will JSR to the linkage area, and the linkage area will then JMP to the called function. Internal calls can JSR directly to the called function. An example of an internal and cross-library call is shown in Figure 19 and described below. As the compiler generates code for a component, it passes the code to the object code property with a set of fixups that are used to patch the object code. Each compiled component has its object code property filled. The compiler uses an "object group" model. That is, a component can be made up of multiple types of object code. For example, a function could also have a private static data area associated with it, along with a destructor sequence for that static data area. A static data item could have a constructor and destructor sequence associated with it to initialize it at runtime. Linking is essentially a matter of iterating through the list of fixups and patching the code in an appropriate manner. Different types of fixups are specified through a class hierarchy, with each fixup knowing how to calculate the patch value. For example, a pc-relative fixup knows that it must calculate the difference between the address of its location, and the component which it references. An absolute fixup knows that it must delay calculations until load time. While the linker specifies a set of fixup classes, new compilers may specify new types of fixups. Figure 20 illustrates a set of fixup classes in accordance with a preferred embodiment. If the component is a data component, all its clients are notified of the position. Some clients may have initially been linked with bogus addresses, so this process cleans up all the clients and provides them with the right address. If the component is a function component, then the linkage area for that function is updated with the new address. Notice that this two style approach provides indirect access to functions, and direct access to data. In addition, extra space is allocated so that future updates of the object code has a higher probability of being able to use the same area. 12% extra is provided for functions and 25% extra is provided for large data objects. As mentioned above, when the load module property is asked for the address of a function, it will give the address of the linkage area. This means that every function reference is indirect. Figure 21 illustrates a linkage area in accordance with a preferred embodiment. Any functions that are referenced, but not defined, will point to a common Unimplemented() function. Having all uncompiled functions point to Unimplemented(), facilitates the load and run partial applications without forcing the programmer to create stub functions. The previous discussion has laid the foundation for a detailed discussion of incremental linking. When a component is recompiled, the new component size is compared to the old component size to determine if the new component fits in the current location. If it will, then it is stored there, and it is iteratated through its fixup list. Linking is then complete. If the object code for the new component must be relocated, then the old space is marked as garbage, and the new object code is relocated to a new area. Then the fixup list is iterated through. If the component is a function, the linkage entry is updated. Linking is then complete. However, if the component is a data item, then the component must iterate over the list of clients and update their references to this component. Linking is then complete for the data. Figure 22 illustrates the storage of object code in accordance with a preferred embodiment. Each of the graphic objects 2200 has an associated load module property 2250 containing the individual object code associated with the graphic objects 2210, 2220, 2230 and 2240. Since all code is linked as it is compiled, and support is provided for changing and incremental building, the load module property maintains a map of all the objects allocated in each segment. It also tries to keep extra space available for growth. This extra space wastes some virtual memory space, but does not occupy backing store or real memory. If during the process of repeatedly changing and building an application, the extra space is exhausted, additional space will be allocated, affected segments must be relocated, and all references into and out of that segment must be updated. Figure 23 illustrates a loaded library in accordance with a preferred embodiment. The white sections 2300, 2310, 2320 and 2330 represent free space. Four sections are provided for uninitialized data 2340, initialized data 2350, code 2360 and a linkage area 2370. In HOOPS, the segments have no spatial relationship. Linking uses what will be the loaded relationship, not the relationship that they might have within HOOPS itself. Streams must be written from start to finish, since the loader requires a streamed TLoadModule class, the TIncrementalLoadModule attempts to reduce the amount of information streamed. This means that for most changes in a program, the TIncrementalLoadModule will not have to be re-streamed. The TIncrementalLoadModule gets all the mapping information from HOOPS through the use of a shared heap. Otherwise, any change in data location, or function size would require a new TIncrementalLoadModule to be built and streamed. Figure 24 is a memory map of a load module in accordance with a preferred embodiment. The model for active program modification is as follows. The debugger first stops execution, modified functions are compiled, and located at different locations even if they fit in their current location, the internal linkage area is updated, and the program is continued. If a modified function was active on the stack, the old version will execute until the next invocation of that function. An alternative is to kill the program if active functions are modified. When an application is published, the linker will copy all object code to a file outside of the database. As the segments are copied to an external file, the linker will relocate and patch all the functions. In addition, all intemal calls will become direct calls, and the internal linkage area will be removed. Besides just relocating and linking the object code, the linker must include the meta data necessary for virtual table creation. 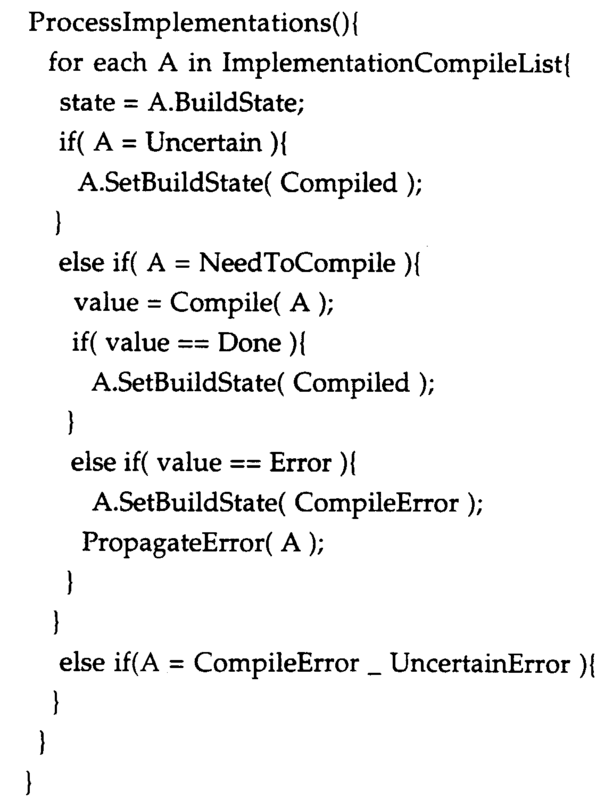 Notice that this step is essentially a relink, the compiler is not involved. A second style of publishing is also required, the style is referred to as a quick publish. A quick publish copies the required segments from the database to an external file. The purpose of this second publish is to support quick turn-around for cross development, or shared work. Figure 25 shows what happens in each type of reference. All of these cases show the internal usage case. If an external library references these same components, this library will receive several GetExportAddress() calls at load time. In response to the GetExportAddress(), a library will return the internal linkage area address for functions, and the real address for data. This allows the functions to move around while the library is loaded. The internal linkage area is completely homogeneous (each entry is: JMP address). The external area has different types of entries. A normal function call will have a jump instruction in the linkage area, while a virtual function call will have a thunk that indexes into the virtual table. Pointers to member functions have a different style of thunk. While the invention has been described in terms of a preferred embodiment in a specific programming environment, those skilled in the art will recognize that the invention can be practiced with modification within the scope of the appended claims. (d) generating and maintaining an interface compile list (604, 607) indicating the interface parts of build components to be compiled, and an implementation compile list indicating implementation parts of build components, said lists are used to generate an compile order to the compiling step and are updated for each compilation performed or sustained for being performed at a later time (705, 712, 804, 806). The method as recited in claim 1, including the step of displaying information associated with the computer program in at least one window. The method as recited in claim 1, including the step of storing a plurality of attributes in the database associated with a particular component. The method as recited in claim 1, including the step of storing the database on a disk. The method as recited in claim 1, including the step of storing information associated with a particular component in a property associated with the component in the database. The method as recited in claim 1, including the step of accessing the information in the database to perform compiles. The method as recited in claim 1, including the step of accessing the information in the database to perform edit operations. The method as recited in claim 1, including the step of accessing the information in the database to perform link operations. The method as recited in claim 1, including the step of accessing the information in the database to perform load operations. The method as recited in claim 1, including the step of the computer system storing a unique name and a container identification in a property associated with a particular component. 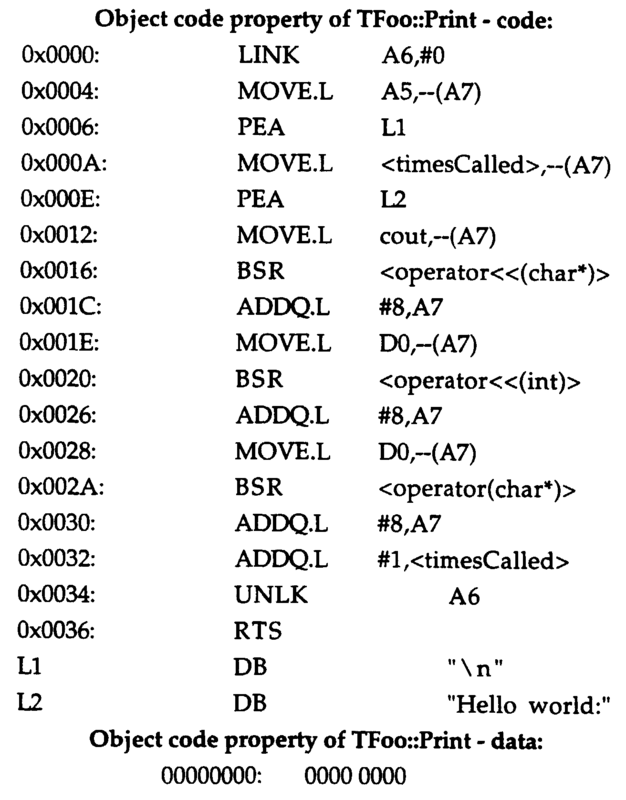 The method as recited in claim 1, including the step of the computer system storing a declaration property representing a compiled symbol table entry associated with a particular component. 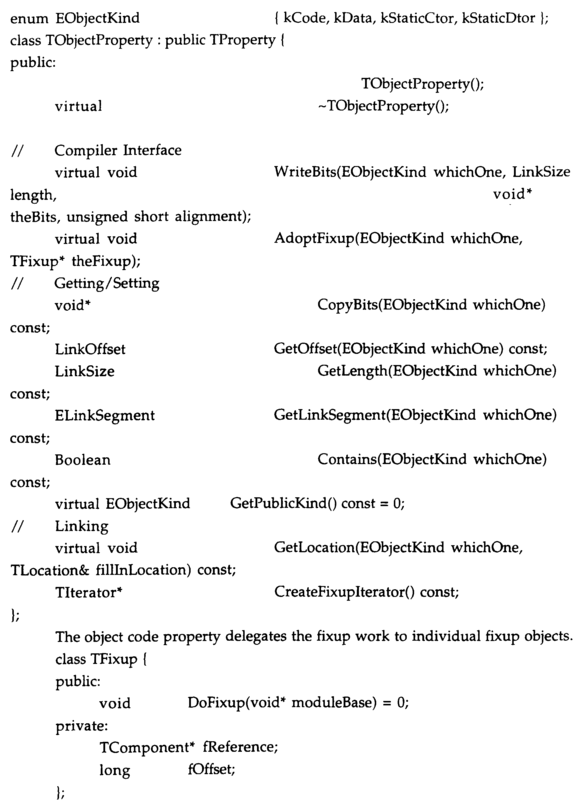 The method as recited in claim 1, including the step of storing object code in a property associated with a particular component. The method as recited in claim 1, including the step of storing a client in a property associated with a particular component. The method as recited in claim 1, including the step of storing a reference in a property associated with a particular component. The method as recited in claim 1, including the step of storing a kind associated with each component in the database. (d) means for generating and maintaining an interface compile list (604, 607) indicating the interface parts of build components to be compiled, and an implementation compile list indicating implementation parts of build components, said lists are used by the build means to generate an compile order to the compiling means and are updated by the build means for each compilation performed or sustained for being performed at a later time (705, 712, 804, 806). The system as recited in claim 16, including means for displaying information associated with the computer program in at least one window. The system as recited in claim 16, including means for storing a plurality of attributes in the database associated with a particular component. The system as recited in claim 16, including means for storing the database on a disk. The system as recited in claim 16, including means for storing information associated with a particular component in a property associated with the component in the database. The system as recited in claim 16, including means for accessing the information in the database to perform compiles. The system as recited in claim 16, including means for accessing the information in the database to perform edit operations. The system as recited in claim 16, including means for accessing the information in the database to perform link operations. The system as recited in claim 16, including means for accessing the information in the database to perform load operations. The system as recited in claim 16, including means for the computer system storing a unique name and a container identification in a property associated with a particular component. The system as recited in claim 16, including means for storing a declaration property representing a compiled symbol table entry associated with a particular component. The system as recited in claim 16, including means for storing object code in a property associated with a particular component. The system as recited in claim 16, including means for storing a client and references in a property associated with a particular component. The system as recited in claim 16, including means for storing a kind associated with each component in the database. The method as recited in claim 1, including the step of storing an errors property associated with a particular component. The method as recited in claim 1, including the step of storing a plurality of compound components. The method as recited in claim 31, including the step of storing a members property associated with a particular compound component. The method as recited in claim 1, including the step of storing a project component. 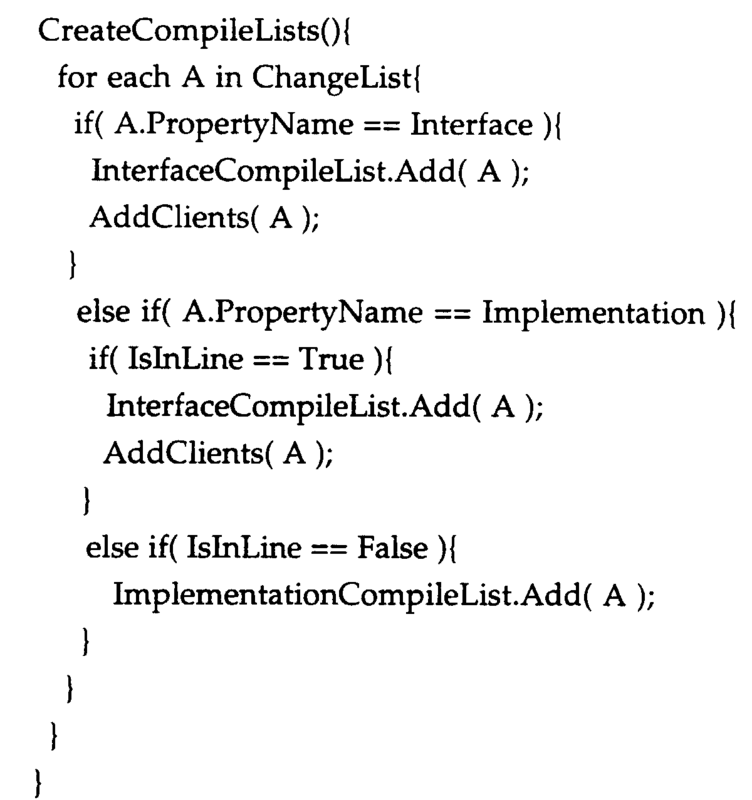 The method as recited in claim 1, including the step of storing a change list property associated with the project component. The method as recited in claim 1, including including the step of storing an error list property associated with the project component. The system as recited in claim 16, including means for for storing an errors property associated with a particular component. The system as recited in claim 16, including means for storing a plurality of compound components. The system as recited in claim 37, including means for storing a members property associated with a particular compound component. The system as recited in claim 16, including means for storing a project component. The system as recited in claim 16, including means for storing a change list property associated with the project component. The system as recited in claim 16, including means for storing an error list property associated with the project component.